Are you still in need of back to school supplies? 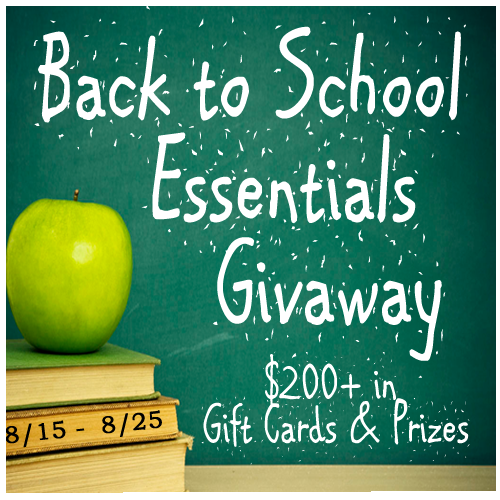 We have a great prize pack that includes back to school gear and gift cards valued at over $200! The Back to school Essentials Prize Pack giveaway is hosted by So Cal Coupon Mommy, Frugal 4 Four and Blogger Media Team. We have teamed up with some GREAT sponsors like, Chico Bags, Kimmy’s Shop and more plus some AMAZING Bloggers to bring you this awesome giveaway. This giveaway is open to US Residents, ages 18 and over. Giveaway starts on August 14, 2012 at 12:01 am EST and ends on August 25, 2012 at 11:59 pm EST. Please enter in the rafflecopter below. « Watch, Play, WIN $100 Cash! The gift card for Target or Wal-Mart. That would really help get new winter coats for my grandkids. Most excited about the $100.00 Walmart of Target Gift Card!! Very excited about that Gift Card to Walmart!! Thank You so much!! I am most excited about the $100.00 Walmart of Target Gift Card!! The gift card. Thank you for the opportunity! The $100 Walmart GC is the most exciting to me! The $100 Target gift card! I’m most excited about the $100 Target gift card! Target is my favorite store. Hello Kitty Back Pack! I would be my 4yr olds hero! Well, I am pretty excited about a Wal-Mart or Target Gift Card! I am most excited for the $100 GC since I need fall/winter clothing for my boys. I am most excited about $100 Walmart Gift Card! I’d definitely pick the target card. I would like the WalMart GC. i would choose wal mart! I would love to get the Target Gift Card. I would love anything, but I think the Wal Mart gift card would best suit my needs. I would choose Target. Thanks. A $100 Walmart card would be great ty. I would like either one! Walmart is closer though! I would choose Walmart, simply because there are 2 Walmarts closer to me than the nearest Target. I would choose the Walmart gift card, but I love Target too! Probably the Walmart card – Thanks! I would be happy with either. Target would be fun! i would pick walmart since we dont have a target near us! Walmart is the closest store to where I live. Target, please! 🙂 Sounds great! When I was doing the Rafflecopter and refreshed it some of the entries that i have already done were not showing up! It seemed I had to click for the entry again- for example picket fence -I had to do over and the easy entry one. It was like I never clicked on them at all – but I did. Just wanted to let you know this. Thank you for this giveaway and the Walmart card would be so awesome!